TV Stands for LCD TVs come in many styles & shapes to best suit a variety of needs. There are hundreds of sizes and designs to choose from here. You can use a TV stand for LCD TV in different locations, including retail stores, trade shows, waiting rooms, lounges, hotel lobbies and casinos. There is sure to be a plasma rack here to satisfy any need. Each of these plasma racks, TV stands for LCD TVs is made of high quality materials to last for many years, & the prices are the best you'll find anywhere on the web! Shoppers won't find a better selection at such incredible prices anywhere on the web! Are any of these TV stands for LCD TVs suitable for residential use? There is actually a complete section on this site dedicated to flat panel racks designed specifically for the home. Our TV stands for LCD TVs are compatible with VESA standards. VESA compatibility essentially means the agreed upon mounting hole configuration on the back of your television by manufacturers, ensuring most makes & models of televisions will fit onto stands and mounts for TV. Our entire selection of TV wall mounts, plasma television stands, and other TV stands for LCD TVs include the necessary hardware to mount most televisions onto the displays, though some plasma or LCD TVs may require specific screws you can buy at any local hardware store. For further explanation about VESA, please check out our how to page. Some of the TV mounts that we offer are meant for use with televisions that are 12" to 22" that weigh up to 30 lbs. 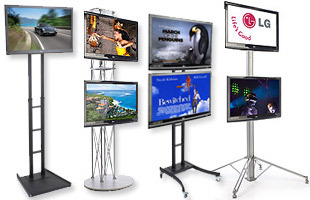 Another group of our plasma stands are designed for 23" to 31" plasma or LCD televisions that weigh up to 50 lbs. 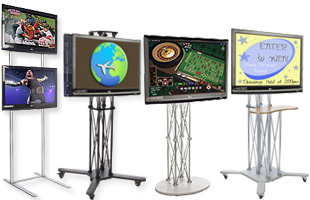 These stands are perfect for displaying smaller presentations at events, and include many different options of stands. You can choose from stands with shelves, pockets, or banners in (2) different heights to best accommodate your needs. Some of the stands hold (2) televisions so that you may display different presentations at the same time. 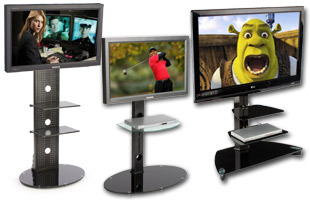 We have a great selection of LCD TV holders for larger televisions as well. 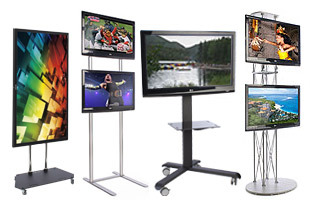 Our selection of 32" to 42" stands can hold a television that weighs up to 70 lbs, while our category of 42" to 72" TV stands can hold monitors up to 80 lbs. Some of these plasma stands include pockets, shelves, and adjustable brackets for placing your television exactly as you want. These displays are some of our most popular, as their tall height combined with a large plasma or LCD television easily grabs the attention of passersby, informing them of your business or products. Many of our plasma stands include a tilting bracket that allows you to angle your television for a better view. Some also include plastic strips to place into the pole that holds up your monitor to assist in keeping wires coming from the television out of place. 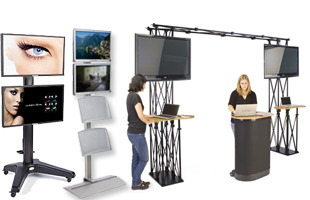 Monitor displays, plasma stands, and some other TV racks we offer have wheels to make portability easy. All of these television holders have beautiful finishes that look great in any setting. In addition to TV displays that are great for commercial use, we offer a fine line of residential TV stands. 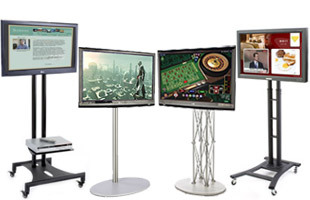 These monitor stands have glass components that stand out superbly in any home. Many of the stands have adjustable brackets for either height or angle, and all are offered at great low prices for the outstanding craftsmanship of each display. Aside from placing in a home, you can use these more upscale units in a waiting room, lobby, or office lounge. 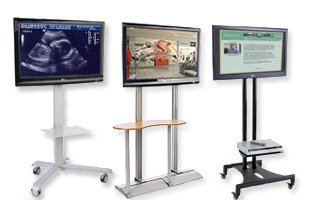 If you aren't looking for a floor standing display, we also offer many plasma wall mounts. 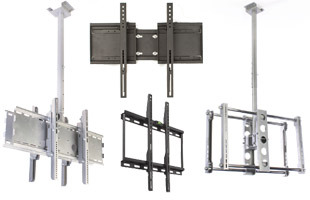 These wall brackets can hold many different sizes of plasma & LCD televisions, and include hardware and instructions on how to mount onto different wall surfaces (though some are recommended to be installed with professional assistance). 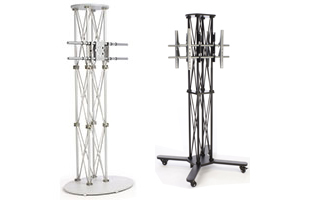 Many of the plasma TV stands have extending arms & tilting brackets to provide the best view possible. In addition to standard wall mounts, we also have ceiling mounts, and desktop stands that include displays that clamp onto a table surface. 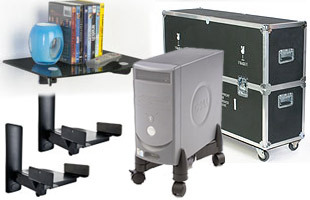 Be sure to check out our line of TV accessories for TV stands. Shipping cases allow you to travel safely with your monitor in a cushioned case to protect it from damage. The AV CPU drawer fits onto most of our satin silver stands, perfect for locking up the laptop that's playing your presentation underneath the stand. We also have rolling holders for desktop computers that adjust around the width of your computer. With over 40 years experience in manufacturing & distributing display products, Displays2Go is a leading national retailer of P.O.P., retail, trade show, & many other products. Our inventory is currently stocked in America's largest display warehouse, and features over 2 million in stock products. Browse through our online catalog for over 7000 individual products, including picture frames, display cases, magazine racks, podiums, restaurant supplies, lobby displays, light boxes, and banner displays. Displays2Go routinely adds new products to our site in order to keep our customers up to date with the latest innovations & styles in display products. Over 90% of our in stock products ship out same day when ordered by 3PM EST, making Displays2go an easy choice for all of your display needs!